NE corner of St John and Cameron Streets. Google Maps. Cnr of St John & Cameron St, August 2016. Included the Olympic Theatre 1840s – 1850s. Mr. Rocher, who appeared in support of the application, defended the couduct of his client [Nicholas Clarke], and contended that he had quilted the London Tavern merely from prudential motives, having, as it appeared, made the discovery that in resigning the Union for the above-mentioned house, he had made an unprofitable exchange. 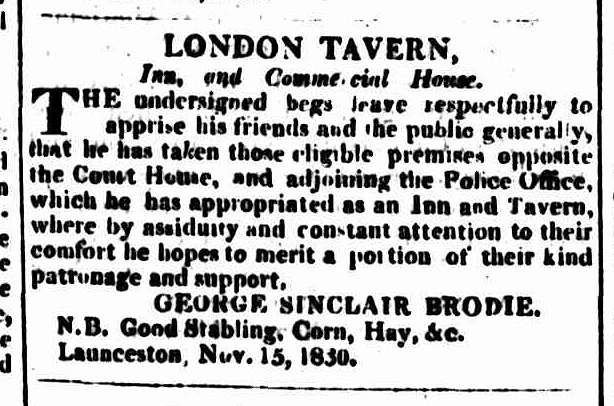 Samuel Storey, London Tavern.-One conviction, dirty, frequented by prostitutes. It was pleaded that, as the theatre was held in Mr. Storey’s premises, an allowance ought to be made; but very little discussion followed, and the magistrates refused the license, reserving in favour of the applicant the opportunity of applying again at the quarterly meeting. Some discussion took place as to the grounds of refusal to be recorded. The clause of the act was read- from which it appeared, if the objection were made to the character of the applicant, he was debarred from renewing his application, and as no objection could be raised against the premises, it was by some considered, that they were bound to record the objection as being against character. 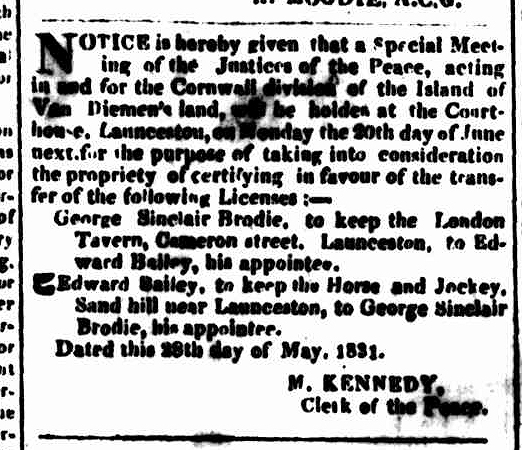 This was disputed by others, some of whom wished to withdraw their votes, unless liberty were given to Mr. Storey to apply again. The votes were taken upon the question, and the majority were in favour of adopting course which enabled the applicant to apply again; but we could not collect what objection was recorded. 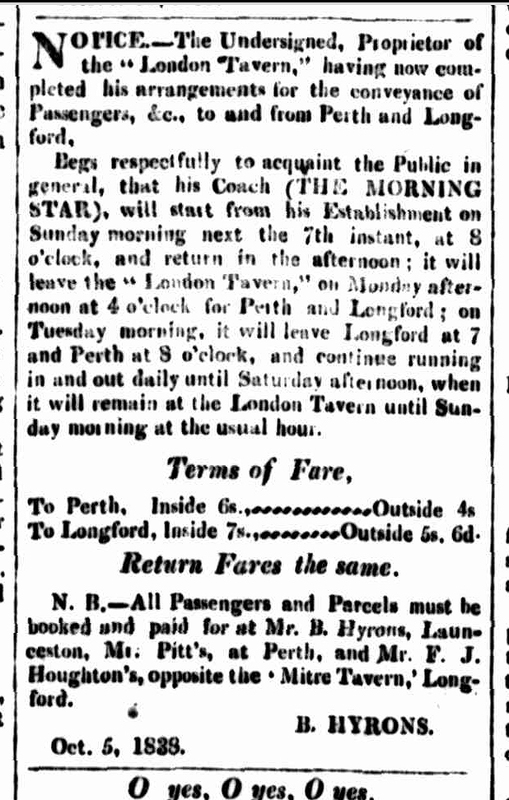 Mr. Douglas appeared for Mr. Storey of the “London Tavern,” and the license was granted with very little discussion. The Theatre has, we understand, changed hands; Mr. Godfrey, of the “Horse and Jockey,” having rented the London Inn. H. Godfrey, London Inn, corner of St. John and Cameron-streets ; granted. The police magistrate had no objection to the house ; it was well conducted and cleanly, but he thought it would would be beneficial if theatrical performances were prohibited on the premises ; the play house was the primary cause of many irregularities, and he should endeavour to deprive it of a theatrical license. 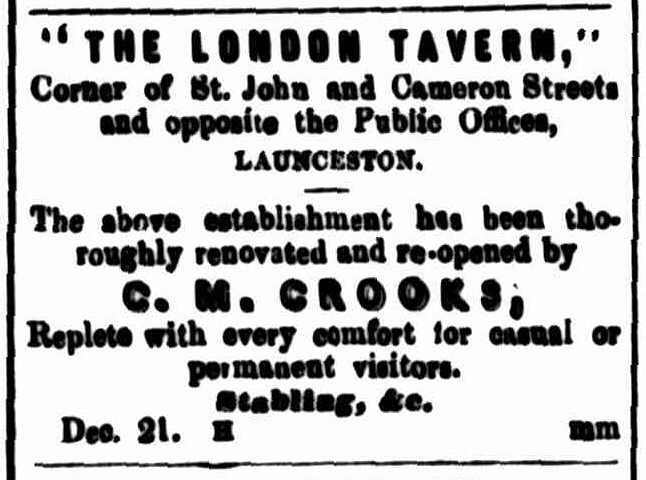 Charles Maryon Crooks, London Tavern, Cameron and St. John-streets. The police magistrate said he must most decidedly object to this application. The house was dirty and badly kept; there was great regularity; there were complaints of the house being kept open all night, and reports of prostitutes frequenting it, and altogether there was not a worse conducted house in town. Mr. Rocher appeared in support of the application. He said the house, on account of its proximity to the Police Office, and municipal buildings, was in a position where stricter surveillance could be exercised than on any other house in town, and yet there had only been one conviction during the year. 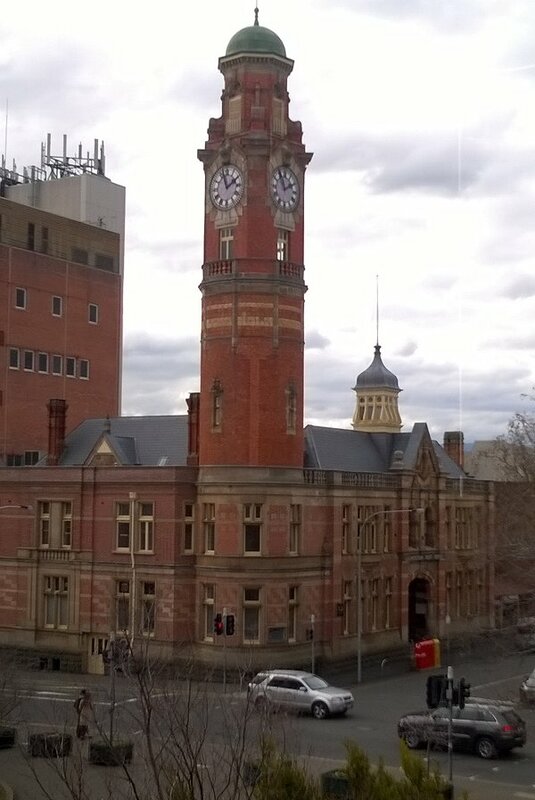 Then frequently there were entertainments going on at the Mechanics’ Institute and Town Hall, and Mr Crooks could not help persons coming from those entertainments to his house. As for the reports respecting persons of bad character frequenting the house, why had not informatlons been laid against Mr. Crooks for the Police Act was stringent enough. If the house was badly conducted it was the fault of the police. After some further remarks, Mr. Rocher appealed through the Chairman to the Superintendent of Police as to the manner in which the house was conducted. The Superintendent of Police said he could fully bear out what Mr. Gunn had stated. The Police Magistrate, referring to Mr. Rocher’s remarks respecting the house being close to the Police Office, said that the Police Office closed at 4 o’clock in the afternoon, whilst the irregularities took place at night. Mr. Rocher submitted that evidence should be given of the irregularities mentioned: a mere re port or complaint was not sufficient. The Chairman said this had never been the practice here. The Annual Licensing Meetings will be held on Monday next. 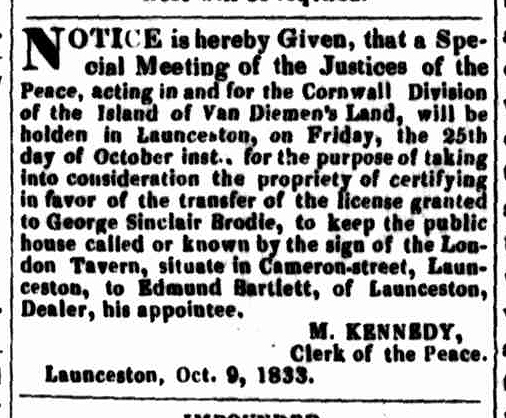 Amongst the applications is one from Mr Alfred Stephen Harris for a license to the house at the corner of Bathurst and York-streets, formerly “Lamb and Flag.” Mr Hely intends to alter the designation of “The Ship Inn,” Wharf, to that of “The Duke of Edinburgh,” and Mr Walter Harris intends to alter the title of his new premises at the corner of Charles and Patterson-streets from “The Turf Hotel” to the “Plough Inn.” Mr W. F. Green applies for a. license for “The London Tavern,” St. John and Cameron streets, and Mr Robert Fox Mitchell for a license for “The O’Connell Inn,” Wellington and Frankland streets. THE LONDON HOTEL — This Hotel, next to the Public Buildings, Launceston,has been taken by Mr. F. B. Watson, formerly of Longford. It is to be newly fitted up as a General and Family Hotel. The London Hotel is very conveniently situated for Visitors from the adjoining Colonies, being close to the Post-office, Town ball, Mechanics’ Institute, Public Buildings, and all the Banks. The Mayor said this house was so very much out of repair; so much so that it was impossibly to keep it in good order. He would recommend that a note be made of this for the information of the landlord. The Mayor said on looking over the Building Act as to what action, the council should take it appeared the surveyor should, with any other competent surveyor, examine the building and report to the council that day week, giving a certificate of his opinion as to the condition of the structure; and on that the Council would come to a decision how to act. His Worship added that he had had it under his own eyes, for some time, and if the Council would notice the roof, they would see the rafters were coming apart from the wall plates, and the end wall and front very much bulged out. Alderman Murphy moved that the action prescribed by the Building Act be taken. Alderman Hart seconded, and remarked that it was a matter of importance to be attended to at once, as the building in question was on the street line, and no doubt it was dangerous, and the Council would be culpable it they did not take action. Alderman Webster–The building has not been occupied for some time, I believe? The Mayor–Not since Mr Watson left. The resolution for the building to be inspected inside and out by the Surveyor and another competent surveyor, and to report on Monday next, furnishing a certificate, was then agreed to. 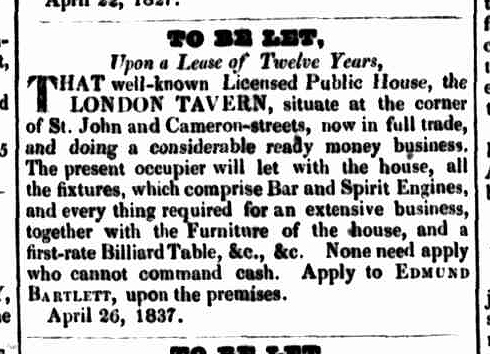 I see the Council are at last moving about the old London Tavern, and not a bit too soon, for the place has been gradually falling for some considerable time past. I have had many opportunities of observing it from the Cameron street stand and I have often had a good look at it and speculated as to how soon it would be before it came toppling over into the street, and how many people It would be likely to kill in its fall ! The Mayor referred to the correspondence with Mr Cameron as to the London Tavern. Mr Cameron said he had made a commencement inside the building, and the putting down would be proceeded with as soon as certain arrangements had been made. His Worship said he saw Mr Cameron on the 10th November and he asked him to delay the matter as he was making an arrangement with Mr Titmus for removing the building; but time was wearing on and nothing had been done. In his (the Mayor’s) opinion the building should be proceeded with at once, and if not done by the owner probably he (the Mayor) ought to take more active steps. Alderman Douglas said he was aware Mr Titmus had been in communication with Mr Cameron, and as far as Mr Cameron was concerned he had left it to Mr Titmus. Alderman Webster suggested that the Mayor should see Mr Titmus, and if he not the power to act, Mr Cameron could then be applied to. 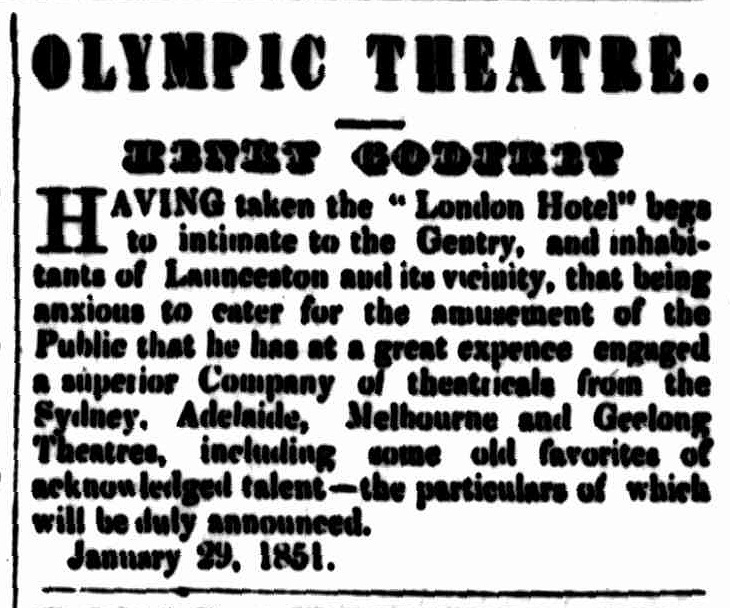 1856, when the Lyceum Theatre was opened on May 20, under the management of Mr. Jones Melville. OBITUARY.-Our George Town correspondent reports the death yesterday morning of a well-known resident, Mr. Feltham Bold Watson, Mr. Watson was an actor and manager in his earlier days, and first came to Launceston from Hobart, He rented and improved the old Lyceum Theatre, a wooden structure that stood on the ground fronting on Cameron-street, near the Bank of Tasmania, now occupied by Capt. S. Tulloch’s new stores, and he introduced several good actors to the Launceston public. He afterwards had a good deal to do with the old Theatre Royal in St. John-street, and was the last landlord of the well-known London Tavern, which stood on the corner allotment opposite the Town Hall. He resided at Longford for a time, and some ten or twelve years ago removed to George Town, where he has since resided. 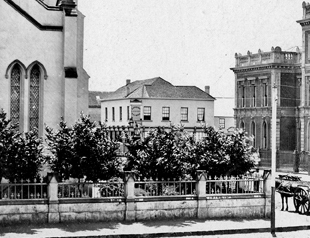 The old London Tavern and Theatre stood at the corner of St. John and Cameron streets, where the Post-office is now situated. The theatre was a properly constructed one, but small. It was in the London Theatre that Mr George Coppin, now the hon. Mr Coppin, played so frequently when in Tasmania, and there also Rogers, one of the finest character actors the world has produced, had portion of his early stage training. George Herbert Rogers was the son of a Wesleyan minister in England. Disliking the monotony of home life he ran away and joined the army. His regiment was sent out to this island, and he became an expert amateur actor during his sojourn at Hobart. Ultimately his discharge was purchased and he entered the theatrical profession. The early records of the Melbourne stage tell us that on June 14, 1845, a small coasting vessel called The Swan dropped anchor in the Yarra, bringing over from Launceston Mr and Mrs George Coppin and their company. The members of that company comprised Mr and Mrs Rogers, Mrs Thompson, Mr and Mrs Hambleton, Mr Thompson, Mr Opie, the scene painter, and a small orchestra led by Mr Megson. Charles Young, an exceedingly clever actor, was also with him. 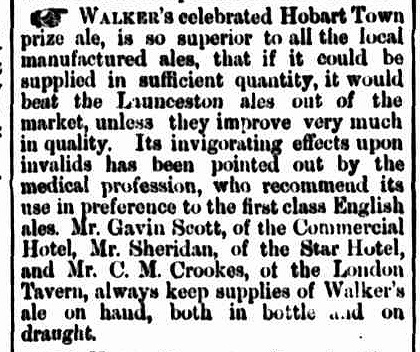 This talented company had been playing at the London Theatre, Launceston. Still following along St. John-street, we come to its intersection with Cameron-street, Post-office corner. Here stood the London. Tavern, on the signboard of which was at one time depicted a view of London and St. Paul’s, but afterwards altered to the London Coat of Arms. The last landlord was F. B. Watson, who was at one time associated with the stage. On the top storey of the London was a comical little theatre, the Olympic I believe it was called, but it fell into disuse after the erection of the Theatre Royal in St. John-street, where the Bijou now stands. This entry was posted in Cameron Street, St John Street and tagged location, photo by Xenith. Bookmark the permalink.